Nate comes from a family of builders and started building himself as soon as he left school. After completing his building apprenticeship and eventually project managing high end residential homes in Hamilton, he moved to Christchurch immediately following the earthquakes to assist with emergency repairs and the rebuild. 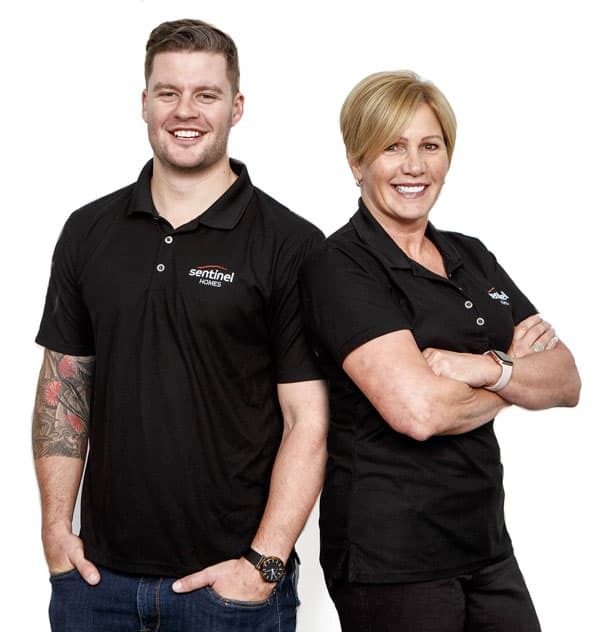 Following on from this Nate worked for himself as a labour-only carpenter and it was during this time that he was able to identify what worked well between different companies and bring it all together in launching Sentinel Homes in the Waikato. Originally a Waikato girl, Del has recently returned from 20 years living and working in Scotland where she was an executive director and business manager. She’s delighted to be back in NZ and is enjoying the new challenge with Sentinel Homes. She has a background in quality management, health and safety and environmental management. As a systems and processes person, her business management skills complement the technical skills of the rest of the team. Having built her own home a couple of times and with an interest in interior design, Del understands the customer experience and is passionate about helping clients into their dream homes and making the experience an enjoyable one.